Jac was sexually harassed and stalked by her supervisor. When she reported it, her manager laughed and did not believe her. Jac declined to provide a photo. My Worst Moment: Oh boy, it’s a toss-up. I was stalked and sexually harassed by a supervisor and, when I reported it and presented Facebook messages as proof, the manager laughed and said she just couldn’t see him doing something like that. 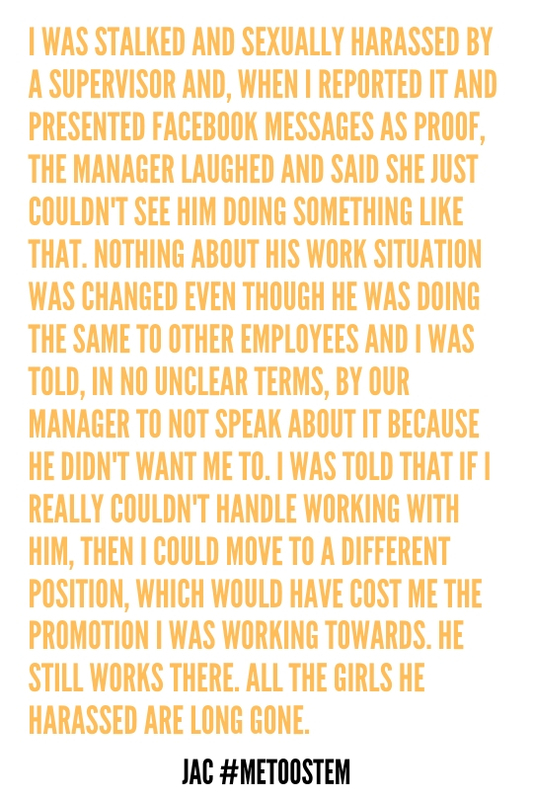 Nothing about his work situation was changed even though he was doing the same to other employees and I was told, in no unclear terms, by our manager to not speak about it because he didn’t want me to. I was told that if I really couldn’t handle working with him, then I could move to a different position, which would have cost me the promotion I was working towards. He still works there. All the girls he harassed are long gone. I have a bachelor’s degree in Management of Information Systems and am currently working on my master’s degree in Information Systems with a focus in IT Security. I’m not an idiot. But I was told by a male engineer once to go make a salad while he worked because “ladies are better at that sort of thing”. On another, my supervisor went on a long rant (to me, of all people) about how his son couldn’t fine a job in engineering because women are getting in easier as Equal Opportunity hires. I wanted so badly to tell him that maybe his son shouldn’t be in the bottom 13% of the male hiring pool, but I didn’t. I let my academic adviser talk me out of staying in the Computer Science program and instead transferred to MIS on her advice because “there’s less math in that major”. I was halfway through a Math minor at the time. My math skills were more than up to scruff. I Have Given Up On: Taking people’s advice or letting their opinions shape mine. I struggle with self-confidence, especially because I came into this field much later than many of my colleagues, and I have always had issues with staying confident in my opinions. There must be something about my overall look that tells people that I must be someone who absolutely needs my opinions and ideals bashed and questioned because it seems to never end. But, I’m learning, albeit slowly, how to stand my ground and decide things for myself. I have given up on allowing people to bully me into decisions. I’m Afraid: I’m afraid that I made the wrong choice in career. I’m afraid that I won’t be happy or fulfilled…or that I’ll end up working for another misogynist or woman who laughs at sexual harassment and stalking charges. This Has Cost Me: Bits of sanity, nights of sleep, self-confidence, a job (when it became too awkward to work with a man who was stalking me and trying to get nudes from another coworker), etc. Definitely the cost of switching majors halfway through a degree. I can’t begin to calculate this. The worst for me was having to be afraid of leaving work at night because I was terrified that my stalker would be waiting for me. Something You Should Know About Me: I didn’t choose STEM. I was told from an early age by my very strict parents that STEM disciplines were the only ones worthwhile, so I worked to become top of my class in all of these fields. Actually, computer science was the only subject that my high school didn’t offer and I didn’t even own my own computer until college (my parents were very against sitting in front of screens). My dream has always been to write and illustrate my own books. But this career path was practical and it irks my parents while also finally meeting their expectations and making them proud. I just hope I have enough time in this world to both be successful in my field and achieve my dream. I’m working every day to achieve both. Is There a Bright Side: The bright side is, I’ve been lucky enough to make extraordinary friends during my time in IT. I now work with a brigade of people who would come to my aid if I ever encountered the same situations that I found myself in before. Not everyone is a bad apple. Don’t let them ruin the bunch for you. Secret Weapon: The thought that a girl who had never owned a computer could, within the space of a few short, turmoil-filled years, become competition to people who had been immersed in technology their whole lives. It’s a pretty good thought.